The ways in which ingredients are prepared and combined to create the robust tastes and textures characteristic of Mexican cuisine have changed little over the centuries. Yes, in many homes, blenders often do the work that was once done by hand in a molcajete carved out of volcanic rock, and pressure cookers sometimes replace the large clay pots in which the household's daily beans were simmered for hours. Stoves, some with ovens, are used by most cooks, yet cooking over coals is still the preferred method to prepare certain dishes, such as pescado tikin xik. And for many indigenous families, charcoal is still the only source of cooking fuel. But preparing Mexican food, though not complicated, remains labor-intensive, especially if you want to capture its essential flavors. Luckily, most of the components of the dishes can be prepared in advance, often resulting in even richer and more balanced flavors. I have been preparing Mexican food for over thirty-five years, and during that time, I have accumulated a great number of utensils (see Sources). The most valuable of these are my cazuelas and comales, two molcajetes, a well-used tortilla press, and a variety of wooden spoons. I occasionally make use of my pounded copper cazuela from Michoacán for deep-frying small chunks of pork into crispy carnitas or for making cajeta , rich goat's milk caramel. Another pot I regularly use is an olla, a large-bottomed clay vessel with a rather small neck opening. It is perfect for cooking beans, though a heavy metal pot can be substituted. The olla takes longer to heat up, but it holds the heat for a long time and imparts the flavor of history. Cazuela. Although a heavy cast-iron Dutch oven or pot can be used for cooking moles, pipianes, and adobos, I encourage you to acquire at least one earthenware cazuela for preparing these and other dishes. I have one 10 inches in diameter for moles, pipianes, and similar one-pot meals. I also have a smaller 8-inch cazuela that I find useful. Cazuelas come in all sizes, shapes, and decorative patterns. Always cure a cazuela before using it the first time. Every Mexican cook seems to have a preferred method. I rub the interior with a clove of garlic, fill the pot with water, and then let the water evaporate over low heat. Repeat the process once, rinse, and it is good to go. The United States Food and Drug Administration recommends against storing foods in these pots because the glaze may contain lead (see Sources for unleaded clay cookware). This is especially true of acidic foods. Comal. In Mexico, a round, flat comal of clay or thin metal is used over an open flame for cooking tortillas; roasting fresh chiles, garlic, onions, tomatillos, and tomatoes; and toasting dried ingredients. A griddle or heavy cast-iron skillet can be substituted. I still use the same comal I have had since 1951, now encrusted with memories of all the wonderful meals I have ever prepared on it. When using a metal comal for the first time, heat it, wipe it lightly with oil, and heat it again, then wipe off any excess oil. The beautiful and very fragile clay ones are difficult to obtain in the United States and are hard to bring back from Mexico in one piece. I have two that I treasure. Molcajete. I use my volcanic rock three-legged molcajetes (mortars) with a tejolote (pestle) for making salsas and guacamole and for grinding dried chiles and spices. I have one that is 6 inches in diameter and another that is an inch larger and ideal for preparing guacamole. Look for a molcajete in a Mexican market, and always search for one with a fairly smooth surface and very small pores. If water is poured into the bowl, it should never seep through the surface. If it does, it means the surface can flake off when grinding, adding grit to the salsa. Avoid the light gray molcajetes often carried in cooking-store catalogs, as they are typically too porous. To ready your molcajete for use, grind a handful of uncooked rice to powder with the tejolote. Rinse, dry, and repeat two or three more times until no grit is in the rice. Today blenders, or licuadoras, are found in many Mexican kitchens, but if you use a blender rather than a molcajete for making salsas, the texture will not be the same. Spice grinder. An electric spice grinder or an electric coffee grinder dedicated to spices is invaluable for grinding larger quantities of spices. Tamalera. If you plan to make tamales often, I suggest you purchase a tamalera, a specially designed pot for steaming tamales, at a Mexican market. It will have a perforated rack for suspending the tamales above the steaming water, a divider for holding the tamales vertically, and, if you're lucky, a small opening in the lower part of the pot for adding more water, if needed. For me, a tamalera that is about 18 inches high and a little less across is perfect. Don't worry if you do not have an authentic Mexican steamer for tamales, however; any big pot with a tight-fitting lid will work. You will need a perforated rack that can be propped up 3 inches or so above the bottom of the pot so that the simmering water underneath can surround the tamales with steam. For smaller amounts, or for resteaming, a Chinese bamboo steamer works well. Tortilla press. I have watched in awe as manually dexterous women from Yucatán and other regions quickly rotate and flatten a lump of masa into a perfect tortilla with their hands. But most cooks rely on a tortilla press to achieve a similar result. The press, usually of heavy metal, consists of two flat plates, each 6 to 7 inches in diameter, hinged together so that the top one can be lifted and then lowered to flatten a small ball of masa. The presses are available in Mexican markets, many specialty food stores, and online. These three techniques are used when preparing chiles, onions, garlic, tomatoes, and tomatillos for most salsas and sauced dishes. Use chiles with few indentations in the body so that the surface will char as evenly as possible. If you have a gas stove, place the chiles on the stove top directly in or over the flame and, using tongs, turn them often until the skin is well blistered and the flesh is just beginning to soften, 2 to 4 minutes. The aroma that the roasting chiles emit is the very essence of Mexican cooking. An equally satisfying method is to follow the centuries-old practice of Mexican cooks, roasting the chiles directly over white-hot coals on a small grill. If you plan to stuff the chiles, always prepare a few extra in case some tear. Chiles can also be lightly brushed with oil, placed under a preheated broiler, and roasted, turning them frequently, until blackened on all sides, 5 to 8 minutes. Chiles prepared this way are usually too soft for stuffing but are satisfactory for cutting into rajas, or strips. If roasting more than a dozen chiles, Ricardo suggests pouring oil to a depth of several inches into a heavy pot, heating it until it begins to shimmer, and then submerging the chiles, a few at a time, into the hot oil and turning them frequently with a perforated spoon until they are totally blistered, 2 to 3 minutes. The moment they are ready, scoop them out with the spoon and immediately plunge them into cold water to stop the cooking. Peeling roasted fresh chiles: Immediately put the just-roasted chiles in a heavy plastic or paper bag, close the bag, and let sweat for about 10 minutes, or less if you want the flesh to be quite firm. If you have used the oil method, this step is not necessary. Peel and pick off the skin, then rub off any remaining blistered skin from the chiles with a damp cloth. It is best to peel and stuff chiles the same day, but they may be placed on a paper towel-lined plate, covered, and refrigerated for up to 2 days before stuffing. If preparing the chiles for stuffing, with the tip of a sharp knife, cut each chile lengthwise from 1/2 inch below the stem area to within 1/4 inch of the bottom and open gently. Remove all of the seeds and membranes with your fingers or a spoon and wipe the inside with a damp cloth, making sure that the inside surface is clean. Pat dry and salt lightly. The chiles are now ready for stuffing. If you are cutting the chile into rajas, cut off the stem end, slit the chile lengthwise, and remove the seeds and membranes as directed, then cut into long, narrow strips. Roast onion quarters or slices on a hot comal, in an ungreased heavy skillet, or on a griddle over medium heat, turning as needed, until slightly charred, 10 to 15 minutes. You may want to line the surface of the utensil with aluminum foil so the onion does not stick. Unpeeled garlic cloves can be roasted the same way until the papery skins blacken, which usually takes about 10 minutes. I follow the same procedure with tomatoes and with tomatillos with their husks removed, roasting them on an aluminum foil-lined comal or skillet just until the tomatoes begin to blister and blacken and the skin of the tomatillos is spotted with brown. Depending on their size and how ripe they are, the tomatoes and tomatillos may need less time than onions and garlic. Cool the tomatoes in a bowl, then slip off the skins, letting any juices fall into the bowl. Any stubborn pieces of charred skin that remain will just add to the rustic flavor. The tomatillos do not need to be peeled. Toasting brings out the flavor of dried chiles, though not all dishes that call for dried chiles require this step. Stem the chiles, cut them open, scrape out the seeds and membranes, and tear into large pieces. Heat a comal, heavy skillet, or griddle over medium heat until quite hot, then place the chile pieces, skin side down, on the hot surface and press down quickly but firmly with a spatula for barely a second. Flip the pieces over and press down again. The pieces will blister, change color, and emit an intense odor of chile. The whole process should only take a few seconds. In Mexican cooking, unhulled sesame seeds are the best type to use. Look for them in Mexican markets and in health-foods stores. To toast sesame seeds and pumpkin seeds, heat a small, heavy skillet over medium heat, add the seeds, and stir them constantly so they don't burn. The sesame seeds will lightly toast in about 4 minutes, the pumpkin seeds in 5 to 8 minutes. Toast cloves, allspice, cinnamon, and other spices and dried herbs the same way, leaving them on the heat for several seconds or so, just until the aroma intensifies. The concept of searing sauces in very hot oil is an anathema to cooks used to long-simmered Italian sauces. What it does is meld the disparate flavors of the puréed ingredients into balance, sweetening and concentrating the flavors. I have included directions for this step in all of the pertinent recipes. Keep in mind that the sauce will spatter and spew as the ingredients blend together. When tortillas will be part of your Mexican meal, if possible, make your own and serve them hot. Although store-bought tortillas (preferably thin ones made from white corn) can be warmed and served, there is no excuse not to make them yourself for special occasions. If you are a novice, practice a few times before you invite friends to dinner. Most Mexican markets sell freshly made masa for tortillas, which comes in 5- to 10-pound plastic bags. (It is also sometimes available frozen.) Use what you need, divide the remainder into smaller portions, and freeze in plastic freezer bags. If you cannot buy fresh masa, look for masa harina, or dried corn flour (not cornmeal, an entirely different product), which can be made into masa with the addition of water. Maseca is the most popular brand, but 90 percent of the corn they use is grown from genetically modified seeds. To make 14 to 15 fresh corn tortillas, use 1 pound freshly prepared masa or 13/4 cups masa harina for tortillas. If you are using prepared masa, put it in a large bowl and knead it with your hands until it has a consistency similar to cookie dough. Add just a few drops of warm water if needed to achieve the correct consistency. It should be soft but not sticky. If you are using masa harina, put it in a large bowl and gradually pour in 1 cup quite warm water, mixing it in with your hands as you add it. Knead the dough briefly until it is soft and smooth but not sticky, adding up to 1/4 cup more warm water, a little at a time, if the dough is too dry. Cover the masa with plastic wrap or a slightly damp towel and set aside for about 10 minutes. If the dough becomes too dry before you return to it, just knead in a sprinkle of water before using. Using one or more heavy plastic bags, cut out two squares each large enough to cover the plates of your tortilla press. Put one on the top plate and one on the bottom plate of the open press. Heat an ungreased comal, large, flat griddle, or heavy skillet over medium-low heat until hot. With your hands, take out a lump of masa and roll it into a 11/4-inch ball (a ball this size will yield a tortilla 5 to 6 inches in diameter). Put the ball in the center of the sheet of plastic on the lower plate and gently flatten it with your hand. Cover with the other piece of plastic and firmly, but not with too much force, press down with the top plate of the press. Lift the top of the press, rotate the circle of dough 180degrees, and press again to ensure the tortilla is of even thickness. The tortilla should be about 1/16 inch thick. Open the press and carefully peel off the top sheet of plastic. Lift off the tortilla from the lower plate with the bottom sheet, flip the tortilla onto the upper part of one hand, and peel away the second piece of plastic with the other hand. If the tortilla is less than perfect, just roll it into another ball and start again. The next step is when most beginning tortilla makers have problems. Slowly tip your hand with the palm up near the center of the hot comal and gently slide the tortilla off of your hand, turning it up slightly (about 45 degrees) so that it falls flat onto the hot surface. Resist the temptation to flip it over. Cook for a count of 20 seconds; the underside should be just freckled. Turn the tortilla over with your fingers or a spatula and cook for another 30 seconds. You may want to flip the tortilla back onto its first side for several seconds before removing it from the hot surface. Ideally, the tortilla will puff up a bit, which is helped by lightly pressing down on it with your fingers or a cloth after the final turn. As the tortillas are cooked, wrap them in a kitchen towel to keep them "warm and lazy." Serve the wrapped tortillas in a towel-lined basket, making sure that the remaining tortillas are always re-covered after guests help themselves. If you will not be eating freshly cooked tortillas right away, wrap them in a kitchen towel and then in aluminum foil and keep them warm in a 2000F oven. If you have made the tortillas earlier in the day, let them cool, seal them in a plastic bag, and refrigerate. To reheat, wrap a small stack in aluminum foil and place in a preheated 3000F oven until warm, about 20 minutes. Yes, you can buy a big sack of tortilla chips for nibbling at your local store, but if you make them yourself, the texture is much crispier than store-bought and they are a perfect way to use up any unused corn tortillas in your refrigerator. Tortilla chips, or totopos, make ideal scoops for Guacamole Clásico , Ensalada de Papas Glaceados con Queso , or for a salsa such as Salsa de Cuaresmeños . Any extras can be used in chilaquiles for a casual brunch with friends. Tostadas, crisp-fried whole tortillas, are a convenient way to serve any of your favorite toppings or taco fillings. I especially like to spread carne apache or scoops of ceviche on the crisp "plates." To make tortilla chips or tostadas, you will need a heavy pot or skillet 6 to 8 inches in diameter and at least 3 inches deep. For totopos, stack 4 tortillas in a neat pile, cut the pile in half, and then cut each half into 3 triangles. You should have 6 triangles from each tortilla. Repeat with the remaining tortillas into 2 stacks. For tostadas, leave the tortillas whole. Spread the tortilla pieces in a single layer on 1 or more baking sheets, cover with a thin kitchen towel, and let dry at room temperature for about 2 hours or up overnight. Heat the oven to 2000F. Pour the oil to a depth of 3/4 inch into a wide, heavy pot or skillet and heat to 3750F on a deep-frying thermometer. The oil should be shimmering but not smoking, and a tortilla triangle dropped into it should become crispy quickly. Adjust the temperature as needed. To fry the totopos, scatter a couple of handfuls of the triangles into the hot oil and toss them with a slotted spoon until they are crispy and lightly golden on both sides, about 1 minute. Using the spoon, quickly lift them out of the oil (which should have stopped sizzling), allowing any excess oil to drip off, then drain on absorbent paper. Discard any that have darkened too much as they will be bitter. Sprinkle the totopos with salt while they are still hot, if you like. To fry the tostadas, follow the directions for heating the oil. Add 1 whole tortilla at a time and quickly fry on both sides until the color deepens and the tortilla is crisp, about 1 minute. Transfer to absorbent paper to drain. Always allow the oil to return to 3750F, or until it is shimmering, before frying the next batch of totopos or another tostada. Cover the totopos or tostadas with a dry kitchen towel and keep them warm in the oven for up to 30 minutes. If the oil has not taken on a burned flavor, it can be cooled, strained, and reused on another day. Although it is best to make totopos and tostadas right before they are served, they can be made several hours or even 1 day ahead. Let them cool completely, transfer them to an airtight plastic bag or container, and recrisp them in a 2500F oven for a few minutes before serving. Cut the tortillas into 1/4-by-1-inch strips or 1/2-inch squares and fry in the same manner as the totopos. Use as garnishes for soups, salads, or other dishes. Corn husks: Packages of dried corn husks (totomoxtles) can be found in most supermarkets, but for the best wrappings, shop at a Mexican market where you are more likely to find husks with their cupped ends intact, which are easier to use. They should be as large as possible, at least 5 inches across at the top. If not, you will have to overlap two or more before using. Separate the husks and put them in a large bowl or pot. Pour boiling water over them, then submerge them by weighting them down with a small plate. Soak them for several hours until they are pliable, then drain and pat dry before using. Banana leaves: You will usually find packages of banana leaves in the freezer section of a market.Thaw the leaves overnight in the refrigerator or for 2 minutes in the microwave, unfold, and cut out any thick veins or long, hard parts. Cut the leaf into unbroken segments of the desired size, reserving the trimmed portions for making long, narrow ties and for lining the steamer. To soften the cut banana leaves, one at a time, pass them slowly over a gas burner until they darken and change texture. Alternatively, loosely roll them, stand them vertically in a steamer, and steam until quite flexible, about 30 minutes. Most of the crema, a rich, thick, slightly soured cream, sold in U.S. grocery stores includes additives to extend its shelf life. So plan ahead and make your own-it's easy, although it can take a couple of days. If you are in a hurry, a good-quality crème fraîche, available in most well-stocked grocery stores, can be substituted. To make 1 cup crema, in a glass container, mix 2 cups heavy cream (not ultrapasteurized) with 1 tablespoon buttermilk or good-quality plain yogurt with active cultures. Cover with plastic wrap, poke a few holes in the wrap, and place in a warm spot (about 800F) until the cream sets and is quite thick, 8 to 24 hours. Uncover, stir, re-cover with new plastic wrap, and put in the refrigerator for 6 hours until well chilled and firm. If the crema becomes too thick, thin it with a little whole milk or half-and-half. The nopal or prickly pear cactus, Opuntia ficus-indica, plays a dual role in the life of Mexicans. It is a prized food source, especially rich in vitamins C and D, and it is a historic symbol, representing the beginning of the Aztec empire. Today, the Mexican flag includes a royal eagle perched on the stem of a prickly pear cactus, in recognition of the early role of the Aztecs. Both the young, tender paddles, or nopales, and the fruits, or tunas, of the nopal cactus are consumed in Mexico, particularly in the central part of the country. Buy the smallest and crispiest paddles you can find; around 6 inches long is ideal. If you do not have a Mexican market nearby and your local grocery store does not carry them, ask the produce manager at the store to order them. They are available year-round. To prepare the nopales, use a small, sharp knife or a vegetable peeler, and holding the base of the paddle, scrape off any stickers and their bulging eyes, moving away from the base. Trim off the thick base and all of the edges and cut the paddle into pieces the size and shape directed in the recipe. Fill a saucepan with salted water and bring to a boil. Add the cactus pieces and a handful of green onion tops, cover, and cook over medium heat, stirring occasionally, until tender, 8 to 10 minutes. Using a slotted spoon or wire skimmer, scoop the pieces out of the water into a sieve or colander and rinse off any remaining viscous residue under cold running water. Drain well before using. Grilling is my other favorite way to prepare nopales, especially for tacos of grilled meats. After removing the thorns, make five slits from the top edge down to within about 2 inches of the base. The paddle will resemble a green hand but with longer fingers. Place the nopales on a lightly oiled grill rack directly over a medium fire and grill until they turn a lighter color with some slightly browned areas, about 4 minutes. Then turn and cook the second side for about 3 minutes. Remove from the grill and use as desired. They are especially good chopped and added to beef tacos, a specialty of the east-central state of Tlaxcala, or used as a variation for Ensalada Clásica de Nopales . Oh, how I love the distinctive taste of manteca, Mexico's rich pork lard. In Mexican cooking, it is essential for making most tamales and for flavoring beans. Although many cooks still consider lard the culinary equivalent of poison, if you put butter on your toast every morning, you can use lard in your refried beans. According to the United States Department of Agriculture, butter has more than twice the cholesterol of lard (60 milligrams per ounce for butter versus 27 milligrams per ounce for lard). I'm lucky that I can buy plastic containers of pale caramel-colored freshly made lard from my local Mexican markets. I store a few containers in my freezer, where they keep for up to a year, and at least one in the refrigerator, where it will stay fresh for several months. Don't even think about substituting those tasteless hydrogenated shelf-stable bricks of waxy fat called lard found in supermarkets. If you cannot buy flavorful lard, it is not difficult to make your own, which I often do. Unfortunately, most supermarket meat departments now receive pork that is mostly fat free, but maybe you can convince your local butcher to sell you several pounds of pork fat and to grind it for you too. If not, every time you buy pork with excess fat, cut the fat off and freeze it until you have enough to render. Then, when you are ready to render the fat, chop it rather fine in a food processor or with a sharp knife. If you will be using oil for frying over high heat, use peanut or sunflower oil refined for this purpose. For other uses, you may substitute canola or safflower oil for the lard. The starting point for preparing many of Mexico's soups, as well as countless other dishes, is often caldo de pollo, a light, aromatic chicken broth. A canned broth can be used, and some are quite flavorful and without additives. But if you make your own broth, you will be able to use up those seldom eaten parts of the chicken you may have, such as the backs, wing tips, and necks. I just cut them off and freeze them to use later. It takes more time to make your own broth, but the results are worth it, and the meat from the meaty chicken parts can be shredded and used in soups, tacos, or enchiladas. Although this recipe may more accurately be termed a stock, as the liquid simmers for a long time with lots of bones after the meaty parts have been removed, I have stayed with broth. It can also be easily doubled to yield 3 quarts broth, using either a very large pot or two pots. In a stockpot or other large pot, bring 3 quarts water to a boil over medium-high heat. Add the chicken pieces and bring back to a gentle bubble, skimming off any foam that rises to the surface. Add the onion, garlic, bay leaves, oregano, peppercorns, and cilantro, lower the heat to a simmer, cover partially, and cook until the meatier chicken parts are tender, about 20 minutes. Remove the meatier parts, let cool until they can be handled, and then pull off the skin and discard. Pull the meat off the bones, shred it, and save to use in soups, tacos, or enchiladas. It will keep covered and refrigerated for several days. Return the bones to the broth, re-cover partially, and continue to simmer until the liquid is reduced by about half and the broth is flavorful, 2 to 3 hours. If the chicken is not covered by liquid at any time, add a cup or so more water until it is. Stir in the salt, then taste and add more salt if needed. Remove from the heat. Let cool, remove and discard the bones, and strain the broth through a fine-mesh sieve into a large container. Alternatively, line a colander with several layers of damp cheesecloth and pour or ladle the broth through the cloth, trapping any sediment. For an even tastier broth, put the whole covered pot, bones and all, in the refrigerator and let it sit overnight. The next day, remove the congealed surface fat with a spoon. Bring the broth back to a boil, then cool and strain. The broth can be refrigerated for up to 5 days. Scrape off any fat solidified on the surface before using. It can also be frozen in 1- or 2-cup containers or in ice-cube trays for convenience. If using trays, pop the cubes free, put them into freezer bags, and store in the freezer to use whenever small quantities are needed. To make a flavorful beef broth, follow the directions for chicken broth, but substitute 2 pounds meaty beef bones, preferably some with marrow, for the chicken parts. I like to make a dark beef broth, so I always roast the bones first in a 4000F oven for about 11/2 hours, then I pour off any fat before transferring the bones to the stockpot. The juice of the aromatic bitter orange (Citrus aurantium) is prized in the southern states of Mexico, especially on the Yucatán Peninsula where it is mixed with achiote and other spices for making a seasoning paste for chicken, pork, and fish dishes. Native to southern China, the bitter orange was brought to Mexico by the Spanish in the sixteenth century. Today it is primarily grown in Yucatán, Chiapas, Tabasco, and Veracruz. The fruit, which has a thick, wrinkled greenish yellow skin, is similar to the Seville orange used for making marmalade. Bitter oranges occasionally show up in markets in Florida and the Southwest. If you can find Seville oranges, their juice can be substituted for bitter orange juice (jugo de naranga agria). I have also found that some cooks from other regions of Mexico use a mild vinegar instead of the bitter orange juice. You can also approximate the juice by mixing together fresh orange juice and fresh lime juice, preferably from the tiny Key lime. To make 1 cup juice, mix together 7 tablespoons freshly squeezed orange juice (from about 2 large oranges) and 1/2 cup plus 1 tablespoon freshly squeezed Key lime juice (from 12 or 13 limes). The juice can be covered and refrigerated for up to 4 days. Or, if you need only a small amount, make just what you need using these same proportions. 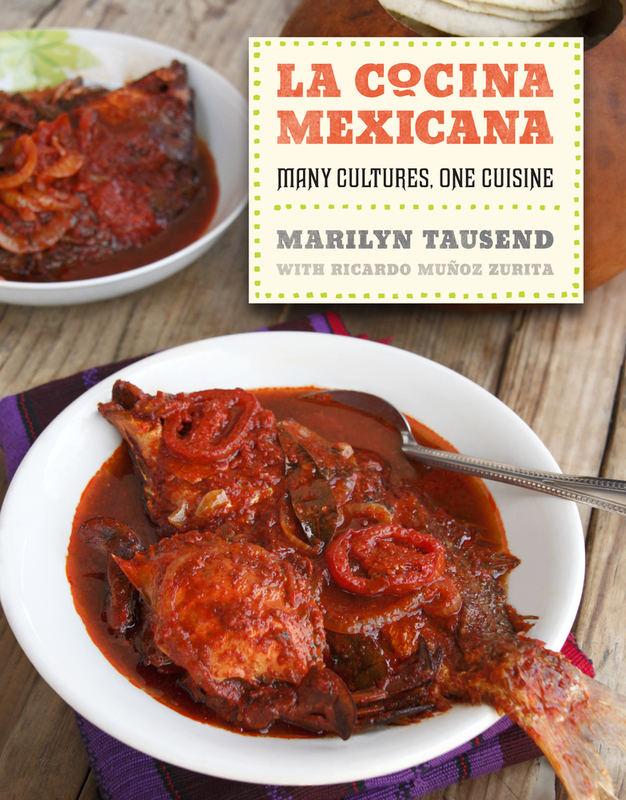 After thirty years of leading culinary tours throughout Mexico, Marilyn Tausend teams up with Mexican chef and regional cooking authority Ricardo Muñoz Zurita to describe how the cultures of many profoundly different peoples combined to produce the unmistakable flavors of Mexican food. Weaving engrossing personal narrative with a broad selection of recipes, the authors show how the culinary heritage of indigenous groups, Europeans, and Africans coalesced into one of the world’s most celebrated cuisines. Cooks from a variety of cultures share recipes and stories that provide a glimpse into the preparation of both daily and festive foods. In a Maya village in Yucatán, cochinita de pibil is made with the native peccary instead of pig. In Mexico City, a savory chile poblano is wrapped in puff-pastry. On Oaxaca’s coast, families of African heritage share their way of cooking the local seafood. The book includes a range of recipes, from the delectably familiar to the intriguingly unusual. Marilyn Tausend is the author of Cocina de la Familia: More than 200 Authentic Recipes from Mexican-American Home Kitchens (winner of the IACP Julia Child Award for the Best American Cookbook of 1998), Mexico the Beautiful, Savoring Mexico, and Mexican. Ricardo Muñoz Zurita is the author of the acclaimed Diccionario Enciclopédico de Gastronomía Mexicana, soon to be published in English, in addition to numerous Mexican cookbooks.